I feel like I have gotten the very best out of both worlds. My interest in the paranormal was sparked well before 2000 and my earliest forays into paranormal research were influenced by some of the great pioneers in this field. I was forced to rely on lots and lots of reading to satiate my curiosity, because that's what was available. But, I really came into age around 2000. That's when I was finally getting old enough to actually start investigating seriously. The age of the internet and the age of paranormal reality television, while not totally dictating my interests in this field, definitely helped shape it. I'm very fortunate to have developed a love and fascination with paranormal research at an early age. I graduated high school in 2001, but even by then, I had been studying paranormal phenomenon for most of my life, thanks to my grandparents recognizing and cultivating my interests. Back then, I read every single book I could find on the subject. I exhausted the small collection my grandparents owned, and then I exhausted my school library's paranormal and folklore section. I interviewed family members about their ghostly experiences. I was in awe of the few television shows that featured paranormal phenomenon. I began collecting a list of haunted locations in my state, and 'investigating' them with a 35mm camera and a micro cassette tape recorder I borrowed from my mom's work. After high school, I was able to take better advantage of the internet and all the resources it had to offer. Social media, especially Facebook, CAN be a great tool. It has made it possible to network and discuss with other investigators all over the world. We can share ideas and debate so easily now, when before, if you didn't know anyone in real life who shared your interests, you were out of luck. I'm still not a huge fan of paranormal reality television and truthfully, there are many faults with this medium...but I recognize the contributions to the field it has made. People definitely are more open and willing to discuss paranormal events, knowing that they aren't alone. And, I used the internet to find a team to join. Freelance investigation and experimentation is fine, but sharing resources, manpower, and differing points of view with an established team really opens up a lot of doors in this quest for the truth. 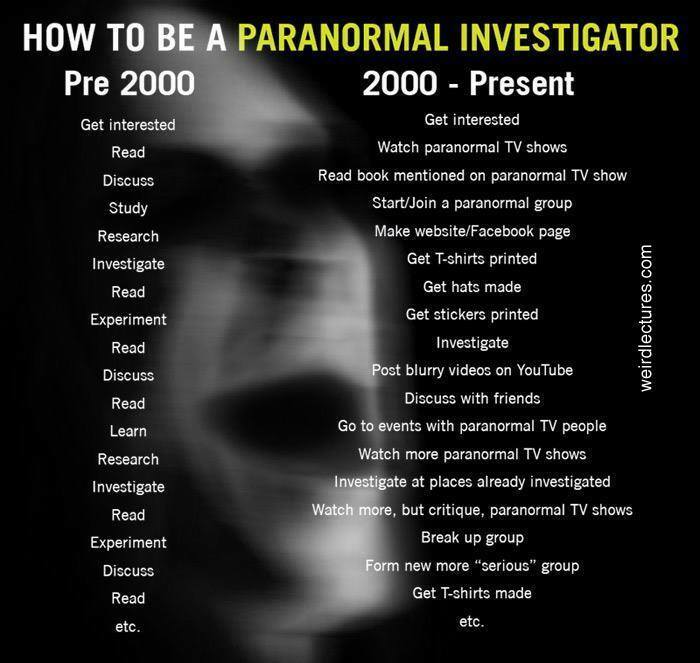 It's pretty apparent I'm guilty of a good number of items on the right-hand side of this list...but that isn't necessarily a bad thing and I certainly don't find fault with anyone who is just now discovering their love of paranormal research. We all have to start somewhere and we all have to grow, make mistakes, learn from those mistakes and constantly evolve. We're all in this together...let's use good common sense, educate ourselves, and encourage one another to be the best that we can be.